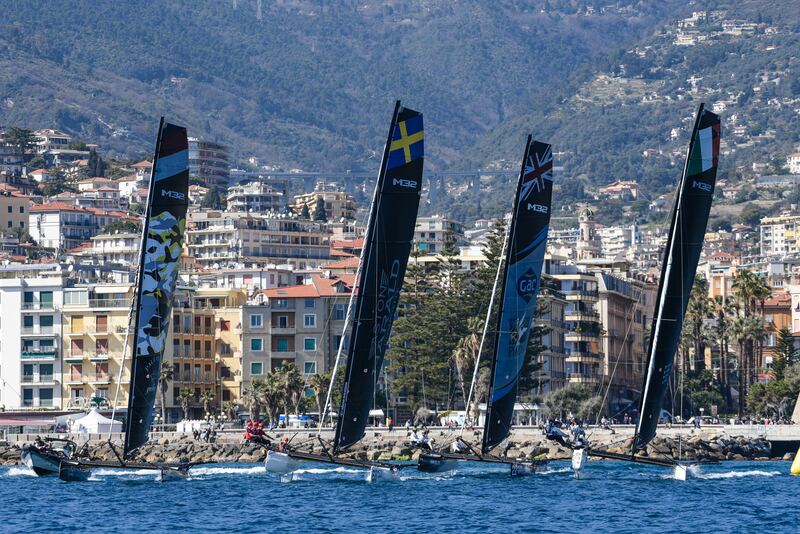 Once again Sanremo defied the forecasters for day two of the warm-up event for the 2019 M32 European Series. While zero wind was predicted, a southwesterly filled in, perfectly timed for today’s guest racing and had built to 9-10 knots for the start of racing proper and to more than 10 mid-afternoon. 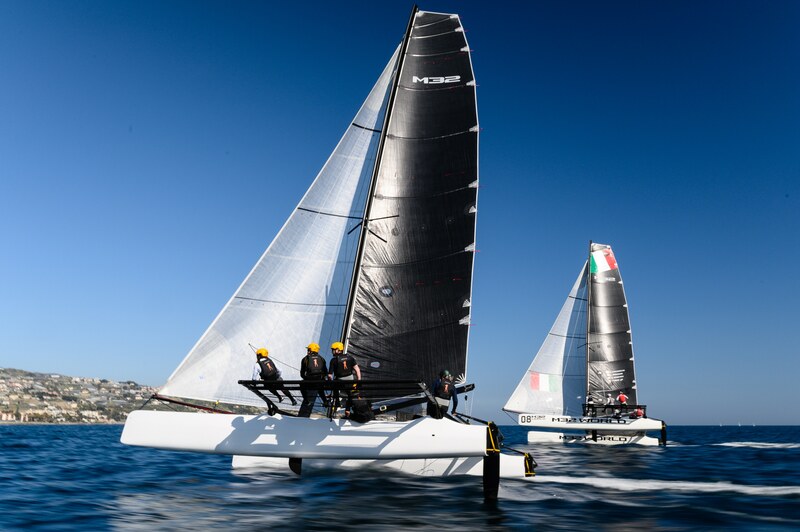 This was more than enough for the nimble high performance one design catamarans to light up on the course set up directly off Sanremo’s old harbour. The breeze held long enough for the race committee to lay on six short races on the usual America’s Cup-style windward-leeward course, with reaching starts and finishes. For a second day it was Ian Williams’ GAC Pindar that was top scoring boat, but on this occasion by a smaller margin. While the six time Match Racing World Champion and defending M32 European Series champion holds an eight point lead going into the final day, today GAC Pindar was only two points better than Cape Crow Vikings, on which Swedish match racer, Nicklas Dackhammar, is standing in as helmsman for Håkan Svensson, boss of the M32’s manufacturer, Aston Harald, who is recovering from a hand injury. Neither boat scored a result out of the top three today, but GAC Pindar scored three bullets to the Cape Crow Vikings’ two. But it could have so easily have been the other way round. While Williams’ crew had won the first race, Crow Vikings claimed the next two and seemed on their way to secure a hat trick. Heading up the last beat as the two boats came into a cross Dackhammar dialled down the British M32. But Williams didn’t seem to lose out especially and when the two boats came together at the final mark, GAC Pindar this time holding rights, Dackhammer was forced to tack away allowing the British skipper to take lead going into the last reach to the finish. “That was an example of us being rusty,” admitted Dackhammer later. “We would have had him easily if we extended before we tacked ahead. We were crossing each other at the same level and he had to make a tack if he had continued. Anyway, it is good that we make those mistakes now rather than later in the season. Like yesterday, Inga Racing Team, making its catamaran debut here after long stints in the Farr 30 and Melges 32 and 40, had a better second half to the day. 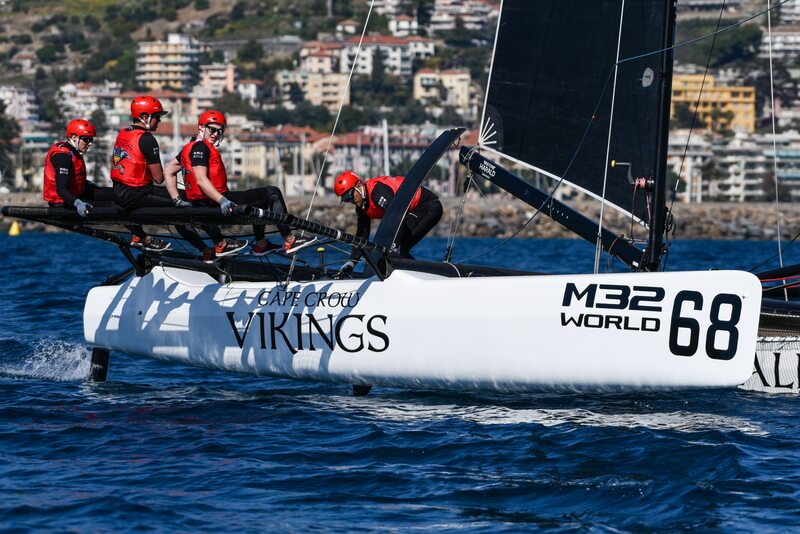 The Swedish team won the penultimate race and was leading the final one, only to be overhauled by the more experienced GAC Pindar and Cape Crow Vikings. The local team on Guido Miani’s Team Shark, being sailed here by Sanremo’s own son Andrea Vacchino and a team of his friends, are experienced sailors but, like the Inga Racing Team are mostly having their first experience on board racing catamarans at this event. Typically they race on a Swan 45, so the ultra-lightweight catamaran with its racks and its hull fling and ability to race in four knots, is providing an eye-opener. “It was more fun today with a couple of knots more wind,” said Vacchino. “I started to discover the boat a bit more, but looking at the results it looks like I paid the price for that! It is incredible because every 20-30 seconds you are manoeuvring, but it is good for the crew work. While Bjørnholt personally has some previous experience in the M32, generally his crew do not, so they too are on a steep learning curve. 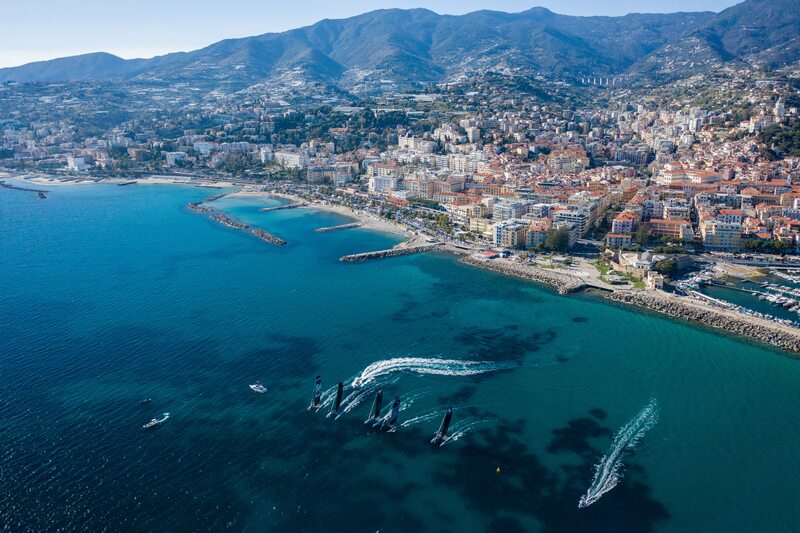 Tomorrow, Sunday, is the third and final day of the M32 European Series warm-up event in Sanremo. It will be interesting to see if the newbie teams can further challenge the ‘old hands’.